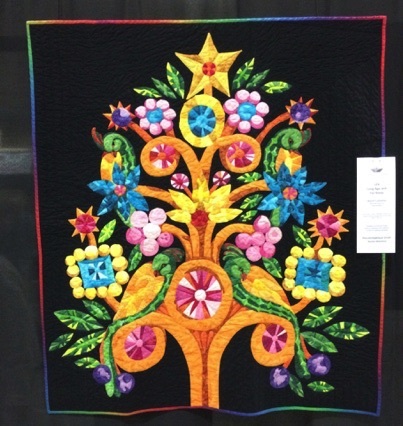 I saw you at the Smoky Mountain Quilters Guild Meeting in Franklin last summer and was captivated by the incredible quilts you showed us. I bought your book, cd, iron and French fuse after the meeting. I looked for a project to use your method as I was so excited to try it. 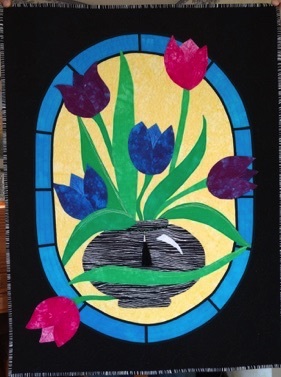 My pastor asked me to make a quilt to hang on the front of the pulpit in the sanctuary that would use the colors in the church's stained glass windows. Of course I agreed and went in search of stained glass liturgical patterns. A fellow guild member called me from the local used book store and told me to come meet her--she had found two books of stained glass cross patterns! So, off I went and got both books. 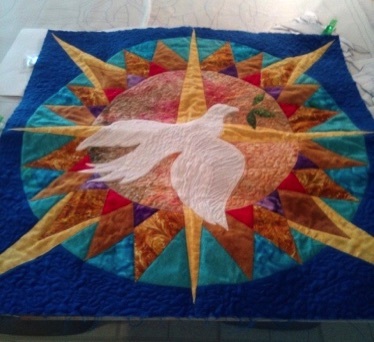 My pastor made some suggestions for modifying the design, and I enlisted the help of a church friend who sews a lot, had space for layout and assembly, plus a Bernina sewing machine that handled the monofilament thread and quilting tasks beautifully. Many many hours went into this labor of love, which I equate to birthing a baby! The quilt is now hanging in First Presbyterian Church in Franklin, NC and I showed it to the guild at our Christmas luncheon on Monday. Another guild member now wants to try your method! Thank you for sharing your creativity with us and inspiring us to try something new. Thank you for your book, videos, ideas, and fabulous work! I have to share with you the first piece I made using your technique. I took it to our county fair and won a purple Grand Champion ribbon for it! 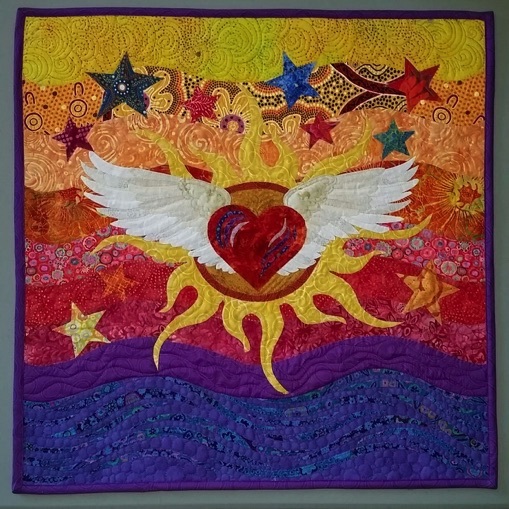 This way of quilting has opened the flood gates in my head and can't wait to create more designs. The possibilities are endless! Thank you and keep sharing your beautiful art pieces! I had this pattern for many years and had several ideas on how to make it work. After starting, and giving up several times I came across Ann's method. It worked beautifully. A lot of quilters suggested that I simplify the design but I liked the gemlike quality of the leaves and the details in the birds. I had to make a few modifications to Ann's method but it went together so much more easier than I thought. I would definitely recommend it as a solution to working a complex design. “....I have watched your video so much that I feel like we are friends. Gloria Cotton -March 10, 2015.
blocks for her quilt. So, large or small, the possibilities are endless. 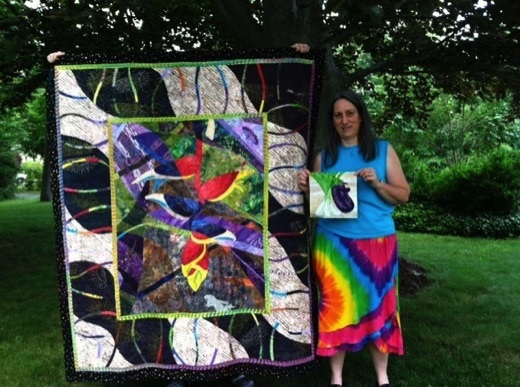 Several years ago I took Ann Holmes class on "No Sewing Until You Quilt It" and it changed how I make quilts. It opened up a new world where fabric became more like paint on canvas than little cut up pieces that had to match exactly. I use this method of quilt construction almost exclusively now, and I would recommend Ann's book to anyone who wants to expand their quilting horizons. 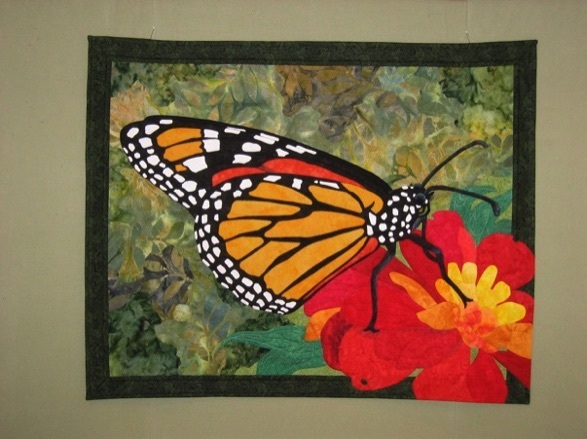 I took Ann’s class when she came to teach it to our Quilt Guild. I would consider myself an intermediate beginner—and this technique was completely new and exciting for me. 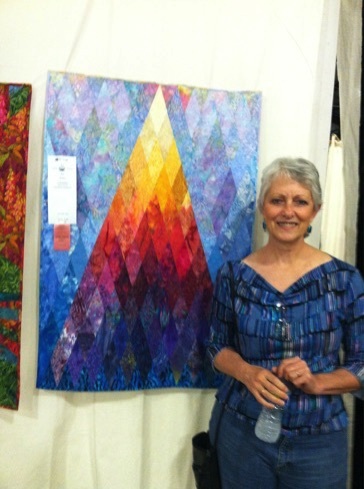 It was fun to quilt by echo lines—and it was especially fun to learn the picture creative part of the process. I am proud to say that I created my own piece after I finished the angel—for our show Challenge. My effort won me one of the ribbons—“Best interpretation of quote.” (We had to illustrate one of our favorite quotes: “A Journey of a Thousand Miles Begins with a Single Step” ). I am now working on an outhouse for our powder room door! 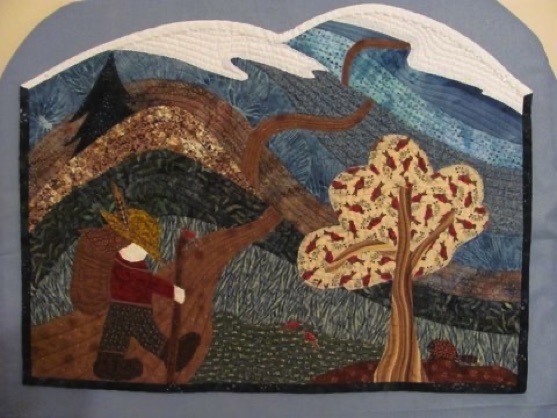 "The convergence of the computer, digital camera and this No Sew Until You Quilt technique forever changed my quilting focus in 2008. I have been totally obsessed ever since!" I bought your book someday ago, add to read it two or three times… (I am not English, I am Dutch) I understood, and I’ve made a lot of quilts with your technic. I LOVE IT ! 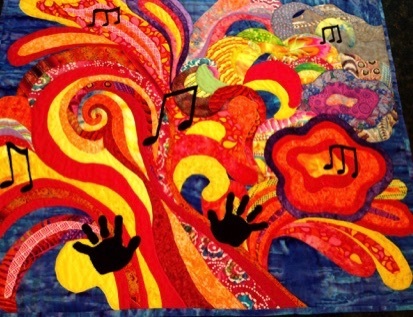 I could show you a few quilts and even a bag, made with your lessons. (See images on left and right.) If you are interesting, ask me for more, I will send it to you ! Any way…. Thank you for the good explanation in your book, and on You-Tube. I showed your technic at a few friends, and they were as overjoyed as I. This is my first time using your "No Sewing Until You Quilt It" and I love it. This is "Let Peace Be Our Compass" from your book.